Track and Field. An individual sport with a team spirit. In fact, it’s more like four sports- sprints, jumps, throws, and pole vault. Quite apart from the abundance of good-looking teammates you’ll have, there’s a whole catalogue of reasons for seriously considering Track and Field as your CCA of choice. 1) It’s sport at its purest. There’s something strangely alluring about running really fast, jumping really high, and throwing heavy metal objects really far. If you want the certainty of knowing that you’re becoming a better athlete without worrying about whether you’re breaking Rule 21.7.2 of Section 3 on the Permissible Substitution of Players, then Track is the place for you. 2) It’s sport at its most versatile. Being able to fire a tiny ball into a tinier goal from twenty yards with nothing more than your trusty Floorball stick is fine and dandy, but you won’t get many chances to use that skill elsewhere. Conversely, Track and Field has countless applications, be it in standing broad jump, running away from friends who want to cake you on your birthday, or even playing other sports. After all, pace, explosiveness (jumps and sprints), and sheer strength (throws) all provide a massive edge no matter what game you’re playing. And if you join pole vault, well, getting abs of solid steel won’t hurt your sporting chances either, to say nothing of your chances in other areas. 3) Training is really fun. It seems almost an obligation for a CCA preview to say this, but the common misconception that all we do is run couldn’t be more wrong. Our coaches for all the sections are both fun and very creative, since they’d get bored too if we just did the same thing every day. We’ve got drills, games, hurdles, contests, trainings at bizarre locations like Botanic Gardens and the beach, and a standing challenge of getting Mr Tan’s car if we throw a medicine ball above the roof (applicable to sprinters only, with throwers excluded by reason of Mr Tan not really wanting to lose his car). If that isn’t enough, you’ll soon fall in love with your teammates, with weekly pilgrimages to Jai Thai, periodic ice-skating, chalets, and overly long gossip sessions that carry over from training into dinner and finally onto whatsapp. 5) If you still need another reason, you might as well go join floral arrangement. Consists of 100m-800m events, as well as hurdles events. Training is Monday, Wednesday, Friday/Saturday, 3 times a week with the fourth training optional. Training is at the RI Yr 5-6 track. National Schools Championships are in late March to mid-April. Consists of Long Jump, High Jump and Triple Jump. Trainings are held on Monday, Wednesday, Friday, 3 times a week at the RI Y5-6 track. Consists of three main events: Javelin, Discus and Shotput. Trainings is Monday, Wednesday, Friday, 3 times a week at the RI Y5-6 track. Trainings is Monday, Thursday, Saturday, 3 times a week at RI Y5-6 Track, although sometimes trainings are held at the gymnasium and swimming pool. 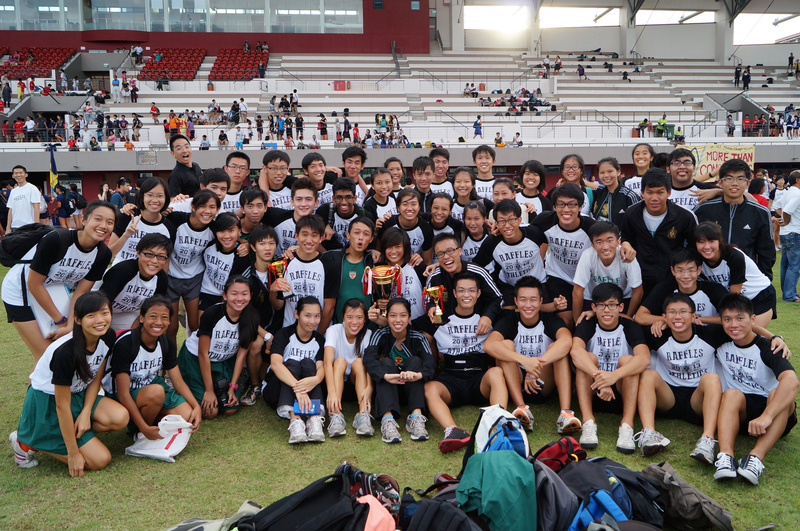 In all honesty and seriousness, Track and Field is a wonderful CCA. If your interests lie elsewhere, we wish you all the best. But if you do join us, congratulations – you’ll learn why the Olympic motto is Faster, Higher, Stronger. Citius, Altius, Fortius.